As-salamu alaykum and hello everyone ♡. Happy Friday! Recently, if you been following my instagram, I just bought a new camera that I have save up pretty much for a year! After getting my hands on the camera I am also looking for a tripod. I can't really find a affordable and simple tripod for my camera. So I found out an online store selling camera accessories at an awesome price. Introducing Fotozzoom. Fotozzoom is an online store offering 100% authentic accessories and camera. 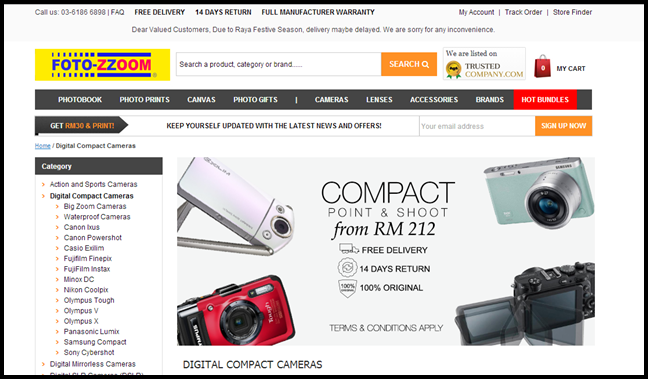 They carry brand such as Sigma, Canon, Sony, Exilim Casio, FujiFilm, and many more. From Tripods, monopods, camera, lenses and photo prints! These are what I got from the online store. 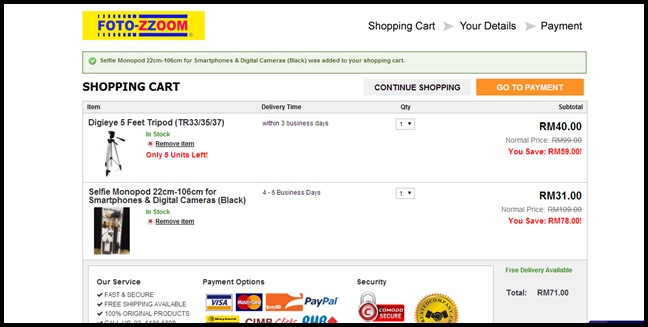 I got a Tripod ( Digieye 5 Feet Tripod ) and the Monopod ( Selfie Monopod 22cm-106cm for Smartphones & Digital Cameras (Black) ) . I was quite amaze by the price because usually tripods cost hundreds. My package came safely and wraped up nicely.No damage or what so every. My tripod is packed inside a box with bubble wrap. I am very satisfied with what I got especially the tripod. If you as, the screw on top of the tripod is universal. Most all cameras can fit on it. It fits perfectly on my Sony Alpha 5000. Adjusting are also easy and secure. I really recommend this tripod to all of you who are looking fora tripod to be use at home for filming or just take photos! I also got a monopod! Haha, its been around right so i guess I will try this monopod for some awesome selfies. hahaha. Do check out http://www.fotozzoom.com/ to find more awesome product as mention. They are safe and trusted. They also accept wide payment terms. My package came fast as promise. They also offer free delivery, 14 days of return and Full manufacturer warranty. boleh lah kita selfie ye!